Jet 10” x 24” Lathe s/n 1109 w/ 75-1100 RPM, Inch Threading, Tailstock. 2014 Ingersoll Rand mdl. UP6-15cTAS-125W 15Hp Rotary Air Compressor s/n UP3042U06068 w/ 120 Gallon Tank, 55 CFM @ 125 PSIG, 29,390 Metered Hours, Pneumatech Refrigerated Air Dryer. 2014 Ingersoll Rand mdl. T30 15Hp Horizontal Air Compressor w/ 2-Stage Pump, 120 Gallon Tank. Sullair mdl. 24KT mdl. 12B-60H-ACAC Rotary Screw Air Compressor s/n 003-74457. Miller Syncrowave 250 CC-AC/DC ArcWelding Power Source s/n KF940151 w/ Bernard Cooler. KBC 20” Pedestal Disc Sander w/ Shop Fox Dust Collector. MAX 20” Pedestal Disc Sander. (2)MAX 16” Pedestal Disc Sanders. MOCON Board, Intuitive Programming System, Power Failure Module, Z Non-Smart Amplifier, Chip Auger, Programmable Coolant Nozzle, High Flow Coolant and Filtration, 18” x 48” Table. 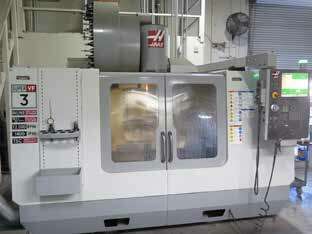 2005 Haas VF-3SSYT 4-Axis CNC Vertical Machining Center s/n 42484 w/ Haas Controls, 40-Station Side Mount ATC, CAT-40 Taper Spindle, 12,000 RPM, Super Speed VOP-SS, Inline Direct Drive Spindle, High Speed Tool Changer, Extended Travel, Programmable Coolant Nozzle, Chip Auger, Floating Point Co-Processor, Brushless 4th Axis, Rigid Tapping, Coordinate Rotation and Scaling, Macros, M19 Spindle Orientation P & R Codes, Hard Disc Drive (USB/PC104/Enet), Floppy Disc Drive, Hand Wheel, 25” x 54” Table, Coolant. Okuma MX-45VAE CNC Vertical Machining Center s/n 9018 w/ Okuma OSP700M Controls, 20-Station ATC, CAT-40 Taper Spindle, Hand Wheel, Henning Chip Conveyor, 20” x 39 ½” Table, Coolant. Hitachi Seiki HC400 All Purpose 2-Pallet CNC Horizontal Machining Center s/n HC40858 w/ Fanuc Series 15-M Controls, 50-Station ATC, CAT-40 Taper Spindle, 12,000 RPM, 4th Axis Thru Pallets, 16” x 16” Pallets, Coolant. Hitachi Seiki HC400 All Purpose 2-Pallet CNC Horizontal Machining Center s/n HC40764 w/ Fanuc Series 15-M Controls, 50-Station AC, CAT-40 Taper Spindle, 12,000 RPM, 4th Axis Thru Pallets, 16” x 16” Pallets, Coolant. Eagle 2-Axis CNC Vertical Mill w/ Anilam Crusader Series M CNC Controls, 75-4200 RPM, 30-Taper Spindle, 7” Riser, 10” x 54” Table. Clausing Kondia mdl. FV-300 Vertical Mill s/n AA-672 w/ Fagor 3-Axis DRO, 60-4000 Dial RPM, Kurt Power Draw-Bar, Chrome Ways, Power Feed, 6” Riser, 11” x 58” Table. Clausing Kondia mdl. FV-1 Vertical Mill s/n AA-22 w/ Fagor 3-Axis DRO, 60-4000 Dial RPM, Kurt Power Draw-Bar, Chrome Ways, Power Feed, 9” x 48” Table. Bridgeport Series II Special Vertical Mill s/n 4140S w/ 2Hp Motor, 60-4200 Dial RPM, Chrome Box Ways, Power Feed, 4” Riser, 11” x 58” Table. Pyro-Systems mdl. 910-ACF-C 1200 k/Hr Melting Furnace s/n 147. Lindberg Gas Fired Melting Furnace. Fesco Metal De-Gassing Unit s/n 3029. Foseco Foundry De-Gassing Unit s/n 1255. (2)Hoge-Warren-Zimmermann Sand Mixer/Loaders s/n’s 16C518, 16B103. Hoge-Warren-Zimmermann Sand Mixer/Loader s/n 16C502 (FOR PARTS). (2)Brent mdl. Sr-14 Slab Rollers. 36” Dia x 24” Vacuum Chamber. Grieve Modified WTC7127-650 650 Degree 1,200,000 BTU Gas Fired Drying Oven s/n 411574. (3)Custom Gas Fired Drying Ovens. 81” x 81” x 120” Gas Fired Drying Oven. Thermal Systems mdl. TS333PB 1250 Deg Electric Kiln s/n 9804. Despatch mdl. ENR0009H100E 1000 Deg Electric Kiln s/n 158152-L.
Quincy Labs mdl. 31-350S 1920 Watt Electric Lab Oven s/n B33S-00251. Command URMA Digiset 2 40-Taper Tool Presetter. (3)Huot Tool-Scoot 40-Taper Tooling Carts. Bridgeport 12” x 20” Sine Table. Drills, Endmills, Taps, Reamers and Perishable Tooling. V-Blocks, Angle Plates and Parallels.